The collection showcased graphic design elements. 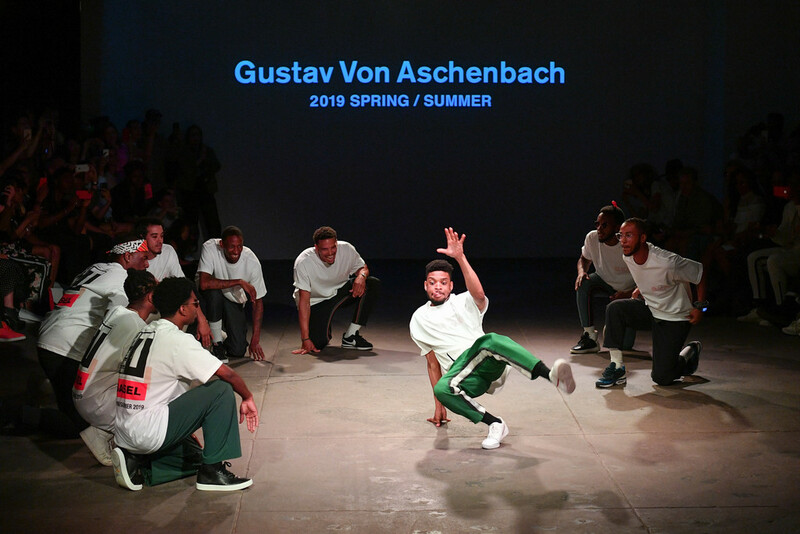 In its third season, Gustav von Aschenbach by Robert Geller Spring/Summer 2019 New York seems to be finally developing its own identity. Although a younger and more fun offshoot of the designer’s main line, the collection still has Geller’s signature. But G.V.A., as the line is now being called, has more of a streetwear edge. The use of logos, slogans and appliquéd photographs spoke to Geller’s love of Swiss graphic design and typography — as evidenced by the word Basel used on garments throughout. “The G.V.A. kid is evolving into a young artist, who expresses himself through individualistic, self-confident clothes,” Geller said. Some of this artistic expression shone through in a creative casting mix of models and New York street. Among the highlights was an array of light outerwear, from trenchcoats and cropped field jackets to utility varsities. Embellished with the graphic details, these became one-of-a-kind pieces. Geller’s ability to create a younger alter-ego allows him to channel trendier and more of-the-now pieces. But coupled with his more romantic and mature Robert Geller collection, these two sides of his personality seem perfectly aligned.